On ESPN's special "PodCast" page on their site yesterday, you could actually find out. 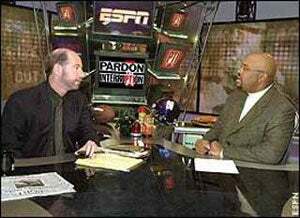 When you downloaded last night's episode of "PTI," hosted by Michael Wilbon and Bob Ryan, you expected to hear Wilbon verbally hugging athletes and Ryan sounded cranky. Instead, you heard the spawn of the devil. Here's what appears to have happened: They've recorded two shows. Maybe the first show didn't go well, maybe they just wanted to try again, whatever happened, they recorded them both on the PodCast and played them over each other. And it's all enough to make your head go even crazier than it ordinarily does when you hear Bob Ryan talk. If you listen close, you can actually hear "Paul (Fahri) is dead ... Paul (Fahri) is dead ..."